Hello there, PlayStation fans! My name’s Daniel Leaver and I’m the lead designer at Dreadbit — a game developer from Guildford, England. I’m a long time PS.Blog reader so it’s truly something special to be able to write a few words here today. I’m proud to present Dreadbit’s debut game for PS4: Ironcast! Whist Ironcast is Dreadbit’s first console game, I’m personally no stranger to PlayStation development. I’d previously worked at Media Molecule as a senior designer for about 8 years, helping to craft levels and features for LittleBigPlanet, LittleBigPlanet 2, and more recently Tearaway on PS Vita. However, Ironcast is the game I’ve always dreamt of making! 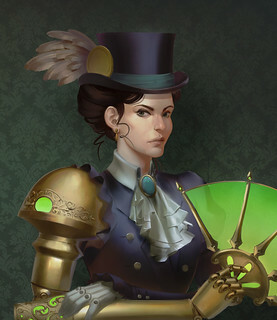 Ironcast is a game of steampunk mech combat, set in a fictional version of the Victorian Era. Inspired by science fiction writers such as H.G. Wells and Jules Verne, Ironcast is set in an exciting alternative history; a time when refined men and women in top hats and bonnets commanded gigantic walking war machines, laying waste to the enemies of the British Empire! You’ll take control of a 7 meter tall walking vehicle called an Ironcast. 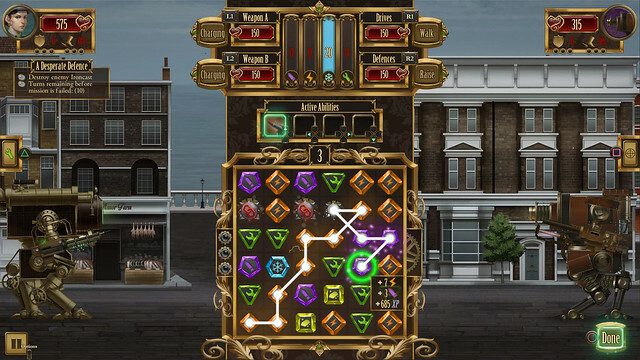 You must face off against an invading force of enemy Ironcast in order to defend 1880’s Victorian England. 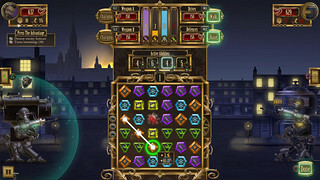 On the surface the game may look like your standard puzzle game, but in action it’s a lot more involved than that. Nodes are collected by linking three or more of the same color symbol from the grid. Each color represents a different resource; orange for energy (powering your Ironcast’s shields and defensive systems), purple for ammunition (used to fire your weapons), green to repair the damage sustained in battle, and blue to cool down the Ironcast’s engines. They might be amazing machines, but this is steampunk — if technology’s not overheating, you’re not doing it right! You can only make 3 matches from the grid per turn, so if you haven’t collected the correct resources from then you won’t be able to activate the systems you may want to, meaning that you’ll need to plan your node collection patterns wisely. Anything less will ensure that you’ll end up as a pile of flaming wreckage! The core of the game is a Roguelite campaign, featuring character levelling, numerous mech systems and weapon upgrades, and randomized loot and mission content. 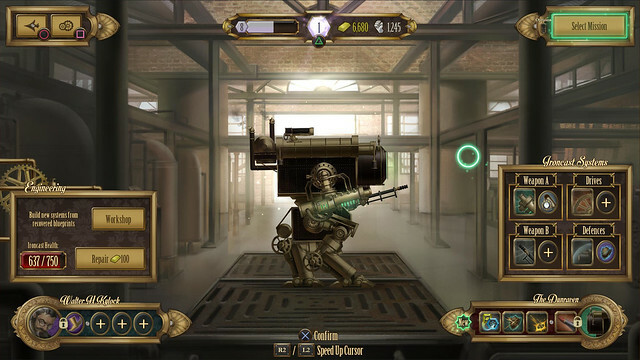 Players choose their Commander character and Ironcast mech, both coming with unique skills and gameplay modifying abilities. 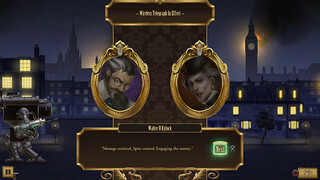 Missions are randomly offered to the player from a selection of 75 unique scenarios, meaning each playthrough will be different from the last. Players also earn Scrap metal from matching yellow nodes and defeating enemies throughout the game. They then spend this Scrap resource on Ironcast upgrades, and constructing weapons and defensive systems, salvaged from the wreckage of their defeated opponents. It’s important that players try to keep ahead of the curve where possible to ensure that they’ll be strong enough to survive the boss encounters. The goal of the campaign is to repel the invasion of enemy forces before they reach the capital, London. Players have 9 days (which is the equivalent of 9 missions) to prepare themselves before the boss encounter itself, gathering experience points, scrap metal resources, and men and women who will help the player combat the enemy Flagship Ironcast. I thank you all for reading this far. Ironcast is a unique and challenging game. I’m sure you’re going to love it when it launches on PlayStation 4 later this year. Looks very intriguing. I’ll definitely try this out. Wow – this looks really cool. Can’t wait to try it. Actually I do like Puzzle Quest quite a bit so I may need to pick this up. can someone please let me know if the lunar rising redux theme ps4 is going to be fixed.i just bought it like 2 days ago it was installed during the update ive tried everything to get it working.this is unacceptable. yay more indies. burn it with fire before it speads. looks interesting, any word on the price of this game? This game looks like a blast, a Mech blast!!! I’m looking forward to hearing more about this in the future. Hello there Graf! We will certainly consider making some PSN assets, like avatars etc. Sounds like a great idea! No doubt we’ll be posting more about the game closer to launch. Stay tuned, steampunk fans! Just a week ago i was think how cool will it be if this game comes to console. Any release date or general window? I’m glad we were able to satisfy your daydreaming mind! No release window as of yet. Later this year is likely. so petty sony.i will boycott you for this.ive been a customer since the first ps1 and you cant even give me any type of answer over a 2.99 theme.that your update broke,your at fault.what do i need to do upload a video to youtube to show you whats going on.can i atleast get some kind of insight will it ever be fixed do you guys even care? atleast tell me am i the only one this has happen to? As a Kickstarter backer who’s been playing since the beta, I can’t recommend this highly enough. Its really a fantastic game! Now that’s REALLY nice to read. Thank you Daljit! This seems like a cleverly made game just might check this out. Looks good. Any plans for a vita version? This looks great! I, for one, love all the indie games that the PS4 gets. So much more variety and risk taking than the big publishers can afford. Also, Daniel, your response to post #6 is fantastic. Great way to deal with the negativity! Hey herb606337 – I’m having the same issue with the Lunar Rising Redux Dynamic theme not working with the latest system software update (2.50)…. although I hardly think calling Sony names and boycotting them will do any good lol. I also think it’s wiser for us to bring this concern to Sony’s cust service dept, rather than post it here on a Steampunk Puzzle Game blog… so I’ll do that and if I hear back anything that’s useful, I’ll send you a pm letting you know. No Vita? Seems like a good fit. Didn’t get to play this at PaxEast, but it looked like a fun time. This would be a great fit on the VITA as well, maybe you guys could easily port it over? VITAAAAAAAAAAAAAAAAAAAAAAA! We need some new games! I’ll probably get this on the PS4, but could you pretty please make a Vita version? This looks perfect for on-the-go gaming, and roguelikes (or even roguelites) are always best on the Vita.